On Friday, August 24, a record-breaking check in the amount of $208.204.81 pesos was delivered to SETAC, which was the beneficiary organization of the OXXO Redondeo Program from May to July of 2018. Puerto Vallarta, Mexico - Thanks to the customers, cashiers and leaders of local OXXO stores, the amount of change collected for SETAC through the OXXO Redondeo (round up at checkout) Program was the largest amount of money ever amassed for a non-profit organization in Puerto Vallarta and the Banderas Bay region. Since its inception in 2002, OXXO's Social Responsibility Program (PRO) has supported over 1,800 non-profit organizations throughout Mexico with over $750 million Pesos delivered to them. But on Friday, August 24, a record-breaking check in the amount of $208.204.81 pesos was delivered to SETAC, which was the beneficiary organization in our region from May to July of 2018. The check was delivered during a very emotional event held in a room provided by the Nayaram Corporation in the Alemar building on Av. Francisco Villa, thanks to the support of Martha Ibarra. The event, led by SETAC Psychologist Ismael Rossi, was attended by the managers and principal supervisors of Vallarta area OXXO stores. Representatives from the five stores that achieved the highest amount in collections were awarded with gift certificates from restaurants El Andariego, La Posta and Mi Querencia; as well as certificates for massages, reflexology and other body wellness treatments provided by therapist Mario García. In addition, the founder of SETAC, Ed Thomas, made a heartfelt speech in which he gave special recognition to the OXXO clients that made this contribution possible. Entertainment was provided by Ana Vásquez and Miguel Martínez of the N Movimiento dance company, which will be representing the state of Jalisco in the next competition to be held at CDMX. Ana and Miguel performed a ballroom dance in an impeccable manner that delighted all of the attendees. 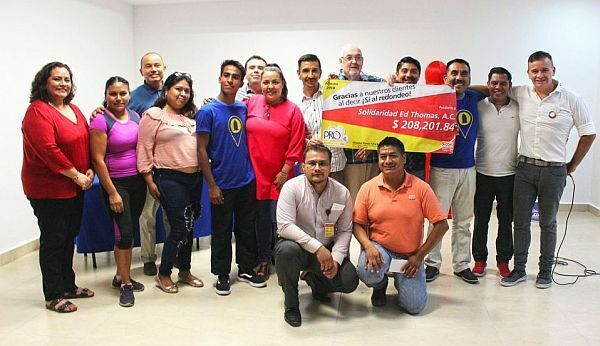 Afterwards, the director of SETAC, Paco Arjona, announced that thanks to the PRO, he had the opportunity to visit 48 OXXO stores from Puerto Vallarta to Bucerías, which were given information and supplies for the prevention of HIV and other sexually transmitted infections. In addition, he said, a total of 20 informative talks were held on Mondays and Wednesdays from May to July in the main offices of OXXO, where a total of 230 new employees were trained and informed about HIV prevention, thanks to the outstanding efforts made by the Coordinator of HIV Education and Prevention Strategies at SETAC, Mr. Fernando Martínez. "The financial contributions we have received from members of our community will be used to complete the psychology and pharmacy areas of the clinic; to purchase supplies, hepatitis B and C rapid tests, and a refrigerator for storing samples for the doctor's office; to pay the study fees for VDRL, creatinine, and the studies necessary for the PrEP program; and the payment of nitrogen, cytologies and biopsies for the CAPASITS clinic, in addition to the medications needed to immediately treat the sexually transmitted infections detected there, among other things," Arjona said. The event came to a close with the check being presented to SETAC by the Human Resources Director for Oxxo in Puerto Vallarta, Miriam Berenice Huante Pineda, and "passing the baton" to the next beneficiary organization: The Santa Barbara Rehabilitation Clinic, represented by the Lic. Elideth Torres. Finally, everyone was treated to Argentinean-style sandwiches prepared by Nicolás Torrieri, a collaborator of SETAC, which were served by the volunteers who took care of all the details that made this such a memorable event. SETAC has a Community Center located at Aldanaca 178, 4A&B (at the corner with Viena) in Colonia Versalles, where you can schedule an appointment for an HIV or syphilis test. SETAC also offers sexual health-related counseling services, along with a variety of cultural and recreational activities to strengthen the local LGBTQ community. For more information, follow SETAC on Facebook, visit the website, call (322) 224-1974 or email contacto(at)setac.com.mx.